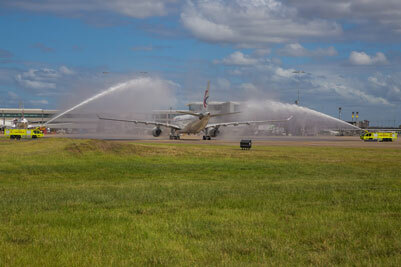 China Eastern Airlines’ inaugural flight touched down at Brisbane Airport on Sunday to a traditional water arch welcome heralding the commencement of a two month season of direct flights between Brisbane and Shanghai. 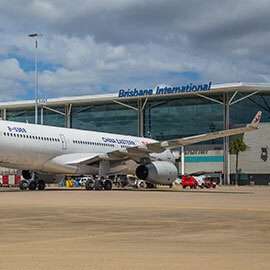 Julieanne Alroe, CEO and Managing Director Brisbane Airport Corporation (BAC), said, “We warmly welcome China Eastern Airlines to Brisbane and look forward to building a strong alliance that will continue to grow in the future. “We also look forward to welcoming more China Eastern travellers to celebrate Chinese New Year and enjoy our city and state’s enviable weather and natural wonders. “I commend the management of China Eastern Airlines for committing important resources to this route and providing essential direct flight connections between Shanghai and Brisbane,” Ms Alroe said. The summer season of flights come ahead China Eastern’s commencement of scheduled year-around flights between Shanghai and Brisbane, which will commence later in 2016. The China Eastern flights are serviced by the airline’s Airbus A330 wide-body aircraft, including lie-flat business class seating. China Eastern Airlines is Shanghai’s largest airline and, from its base at Shanghai’s Pudong International Airport, operates a broad network of destinations across China, Europe, North America and Asia.